Journal de La Reyna (World News Today): The Return Of Reading Rainbow! The Return Of Reading Rainbow! 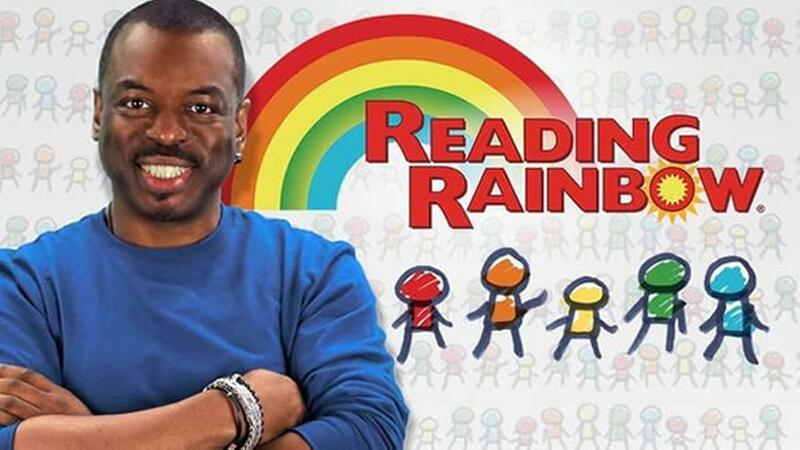 Reading Rainbow is in the works for a grand return. LaVar Burton has motivated childhood memories with his program Reading Rainbow. His show told American youth the gifts of reading a book. You don't have to take his word for it! I mean it was one of the best shows in American media. It's been awhile since the show been off the air, but thanks to Kickstarter, Reading Rainbow is back in business. Reading Rainbow is an American children's television series that aired on PBS from June 6, 1983, until November 10, 2006, that encouraged children to read. In 2012 an iPad and Kindle Fire educational interactive book reading and video field trip application was launched bearing the name of the program. The public television series garnered over 200 broadcast awards, including a Peabody Award and 26 Emmy Awards, 11 of which were in the "Outstanding Children's Series" category. The series was created under the leadership of Cecily Truett Lancit and Larry Lancit, at Lancit Media Productions in New York. The concept of a reading series for children originated with Twila Liggett, Ph.D., and Paul Schupbach (director), of the Great Plains National Instructional Television Library at the University of Nebraska–Lincoln; and Tony Buttino, of WNED-TV Buffalo, New York. The original team included Lynne Brenner Ganek, Ellen Schecter, and host LeVar Burton. Even Family Guy creator Seth MacFarlane (who had Burton as a guest on the show) chipped in a ton of money to bring back the program. Reading Rainbow App was released for the iPad and, within 36 hours, became the #1 most-downloaded educational app in the iTunes App Store. Built from the ground up by LeVar Burton and his company, RRKIDZ, the app allows children to read unlimited books, explore video field trips starring Burton, and earn rewards for reading. The week of June 11, 2013, Reading Rainbow celebrated its 30th anniversary. UN: Israel Is Committing War Crimes! OKCupid Deliberately Trying To Break Couples Up! Kendrick Johnson: Was He Bullied To Death? R. Kelly Dropped From Ohio Concert! Deal$ Under The Family Dollar Tree! The Insurgency's Newest Weapon: Laura Ingraham! The Queen Of Soul Ain't A Fan Of Johnny Rockets! One Good "Terrorist Fist Jab" To Another! Meet Your Neighbors (Down The Street)! Zimmerman Sues NBC And Loses! If I Criticize Israel, Then I'm What? Conservative Outrage Over Obama's Motorcade! Sia Furler: The Uncanny International Pop Star! "Dear White People" Will Outrage Conservatives! Obamacare Got Knocked Down By Federal Judges! Jay And Bey Doing A Banana Split! A Not So Great Destiny! Mom "Who Couldn't Win" Got A Break! Tamar Braxton And Tamara Mowry Host The Real! Stockton Woman Dies In Bank Robbery Standoff! "It's Goin' Down" Literally For Yung Joc! Get On Up: The Story Of James Brown! Rick Perry And Sean Hannity Show Their Guns! The End Of Saturday Morning Cartoons! GOP Picks The Event By The Lake! Nebraska Parade Brings The Outhouse To Obama! It's Not A Good Holiday For Davion Only! CHiPs Caught On Tape Beating Up Woman! Texas Woman Nearly Kills Two Men With Her Ride! Does Wendy's Restaurants Support Rush Limbaugh? You Ain't Getting No Asylum Says American Bigots! Black Republican: They Whiteface Me! Business Owner Kills Ohio Teen!